Ryan “Darth” Bader was the favorite coming into his fight against Tito Ortiz at UFC 132 but unfortunately, The Huntington Beach Badboy got the better of the exchanges on the feet leaving a rocked Ryan Bader shooting into a guillotine and that was the beginning of the end. But just like any heroic figure in history, I’m sure Ryan Bader will be back better and stronger so if you’re a Bader fan, you gotta do it up with the TapouT Ryan Bader UFC 132 Walkout Shirt! Also known as the TapouT Pro Bader Shirt, the TapouT Ryan Bader UFC 132 Walkout Shirt is a standard fit shirt that features red foil accents throughout with quotes such as “To quit does not exist” and “Hated 2 Heroes”. Not really sure what the latter one means but yeah. 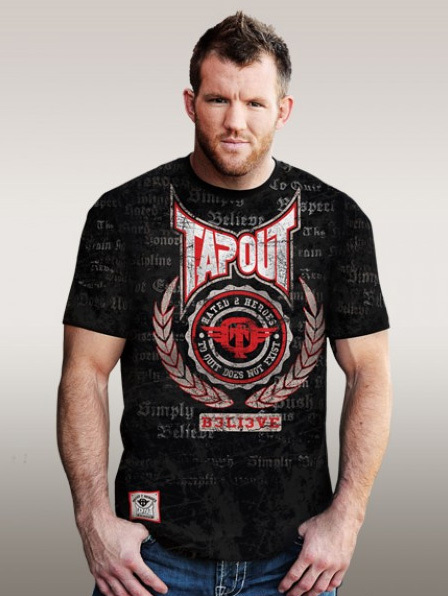 The TapouT Ryan Bader UFC 132 Walkout Shirt is available at MMAWarehouse.